Vivaty just released new features as you can read in their blog. Now you can customize your avatar with more than 200 options, and have a virtual pet that is a little dog. 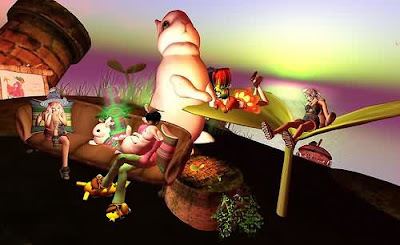 Xiamara Ugajin published a tutorial on how to make decent avatar photo shoots, with steps, tips and tricks for Second Life. The Encyclopedia of Learning Approaches & Technologies has a page on virtual reality that summarizes a big number of resources of all kinds about virtual reality. Hiperia3D News is mentioned there, and it's also an honor for us. A special world has been built in SecondLife for those who suffer disabilities, so they can still train their virtual skills to a good level. A very remarkable project. OpenSim is being integrated with Facebook. For now, users can see the status of their on-line friends and visit the 3D world. Full Facebook integration will be done in the future. Read the rest of the story here, at Virtual Worlds News. In case you didn't know it, here's an article with some pics and info about the Native American Second Life, as mentioned in The Second Life Newspaper. Terra Nova: Do You Like When People Kiss Or Punch You...At Lively? In this interview, Mark Young from Lively recognizes "Many people are delighted by the animation options but many are not happy to be kissed or punched by a stranger". I didn't know that possibility. No strange thing at all, don't you agree? I can imagine punching wars between Lively users, and kissing maniacs being punched. I found a series of free plugins for Photoshop built by Richard Rosenman, and some of them are really useful for 3D, as for example correctors for spherical or lens textures, and the Tiler, for producing seamless textures. Smashing Magazine, excellent site for designers and web developers, publishes a list that is useful for us. It is about user interfaces, and are mainly gadgets, some of them very focused to 3D or using some kind of virtual reality. This site is devoted to teach you Flash3D from the beginning, with live examples and extreme clarity. It is focused to those who are new to computer graphics. JShot is a screenshot capturer that can directly upload the pics you take to an FTP server or image storage services, or send it to your instant messenger. It is free and cross-platform. Search your nearest real 3D virtual reality cinema with this excellent list for many countries that have these kind of facilities. MarketSaw is a site devoted to the movies that are released for real 3D.